Last month OCZ finally unveiled the fruits of its Indilinx acquisition: the OCZ Octane SSD. Based on the Indilinx Everest platform, the Octane was to be OCZ's more affordable high-performance SSD. The drive will be available in two versions: 3Gbps (async NAND), and 6Gbps (sync NAND). Capacities start at 128GB and go all the way up to 1TB. The drive was originally supposed to be available in the channel starting on November 1st. OCZ delayed the launch in order to get some additional testing under its belts. Given the not too distant memories of the infamous SF-2281 BSOD issue, the additional validation time is definitely appreciated. 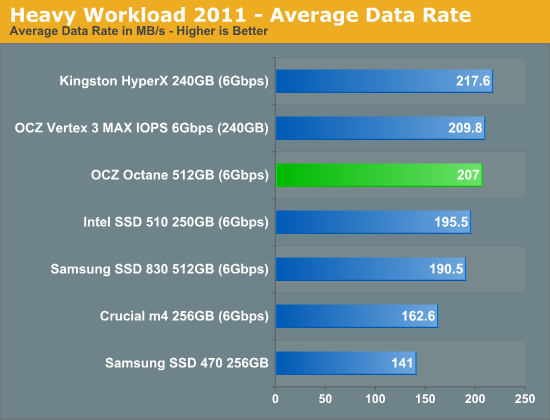 In our Heavy 2011 suite the 512GB Octane does very well, hot on the heels of the SF-2281 based Vertex 3. It's actually beyond impressive that OCZ was able to ressurect Indilinx's seemingy dead controller project and turn it into something that can at least (on the surface) hang with the big boys. I have a lot more testing ahead of me before I can really characterize the drive's performance, but this is a very good start. Inside the chassis we get a look at the drive's Indilinx controller and 512MB (2 x 256MB) DRAM cache. Our 512GB sample features sixteen 32GB Intel 25nm NAND packages, each with four die per package. Check back tomorrow morning for the review! There are two types of people: Those who've lost data without a backup, and those who will. Always make backups. Once you do, the reliability becomes a non-issue, and you can enjoy the speed of SSDs without worry. Your right since I backup my data every month I no longer care about BSOD, stuttering, and the need to rely and frequently make use of my backups. I don't care about reliability since everything that I would put on a SSD can easily be redownloaded. Have to say that I have been dissappointed with my M4 256 fw9 SSD. For the price, encryption and some more performance would have justified the high tag. You do know there are more than 1 way to measure performance in SSDs right? Could be your CPU is limiting speed, not the M4. At work we've got some DELLs with 64 GB Samsung PM..*something*. Definitely not the fastest, even 2 years ago. However, during installs routinely one Core of the i5s (~3.6 GHz) gets fully loaded.. so a faster drive wouldn't help much.